As part of a strategic plan to improve its operations, T&R Precision Engineering has installed award-winning Wogaard Coolant Saver units to a number of its key machine tools. Here, the units provide a cost-effective and environmentally friendly solution to recovering coolant lost during swarf evacuation. T&R Precision Engineering is a privately-owned precision machining company providing finished components, kits of parts and sub-assemblies to the civil and defence aerospace industries. Located in Colne, Lancashire, the company has many accredited quality approvals, including BSI ISO 9001:2008 AS EN 9100 REV C, with customer approvals gained from BAE Systems, Airbus UK and Aircelle (SAFRAN). The company provides an efficient, cost-effective manufacturing facility for its customers, with a highly skilled workforce of over 60 staff applying lean manufacturing techniques and continuous improvement methodology. The shopfloor is currently equipped with a total of 23 advanced CNC machine tools. With the growth of exotic materials within the aerospace industry the company has further developed its hard metal machining capabilities, and new machines provide production and development support for complex titanium, Inconel and stainless steel components. During the past two years expansion and investment has seen the installation of six of the latest Mazak machine tools, ranging from 5-axis 730 Variaxis simultaneous machining centres to 9-axis ‘done-in-one’ Integrex machines. As well as investing in highly capable machine tools the company has also invested in the coolant used. 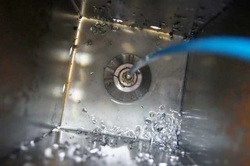 Fluidcare, a total fluid management contract operated by Houghton, uses scheduled checks of all the machine tools’ sumps with corrective adjustments of the coolant concentration and condition being undertaken as required. Currently ten cutting machines are fitted with the Wogaard Coolant Savers & installation is very straightforward as the units are supplied with all of the required connection components and a comprehensive installation guide. T&R’s maintenance engineer fitted each unit in less than 30 minutes. Operation is very simple, once the unit is located in the swarf bin the inline tap is turned on to generate the vacuum and the coolant is sucked back into the machine’s sump. Estimated spend on coolant will be less than £1,000 per year per machine with the Wogaard Coolant Saver fitted. Prior to this it was around £1,300 per machine. “Coolant is an expensive part of the machining process. And, of course, the savings made are on-going, we have calculated a ROI of just 10 months,” Nick Maddison states. It is simple to use once it has been set up, it is now part of the routine at T&R so there is no double handling swarf bins that needs to be drained of coolant. “It does it in situ at the machine, taking just a few seconds to put the unit in place. As an SME we don’t have the resource to have someone looking after this day-to-day, it has to be ‘owned’ by the operator. Now we are recovering the vast majority of the coolant that would have been lost without the Coolant Saver being installed,” states Nick Maddison. T&R has modified the swarf bins on these two machines so they can readily take the Coolant Saver; it is a simple system that works extremely well. These aggressive machines will fill a swarf bin with aluminium chips very quickly so the coolant drag-out is understandably high. Currently the remaining swarf bins use the cost-effective soil pipe method of protecting the Coolant Saver, it works well but T&R will change these to the match the modified bins over the next few months. As the company machines a range of aerospace grade materials, the swarf from these needs to be segregated to ensure a fair price is received from the material recycling service provider. Contaminated swarf has an on-cost in terms of recycling as it has to be drained and the lost coolant has to be correctly disposed of. Before the Wogaard Coolant Saver was considered the company looked at a central holding area for the swarf bins, where they could sit and drain. This would have been a major project in terms of the investment required and all the health and safety concerns, as well as the loss of productive floor space.